Hong Kong, situated at the estuary of the Pearl River Delta, was once the home of simple fishing villages. After more than a century of cultural and traditional exchange, Hong Kong is now one of the world’s greatest cities, where east truly meets west. Hong Kong meaning “Fragrance Harbour” derives its name from a practice dating back 500 years ago. Fishermen in the harbour used to burn sandalwood incense sticks at dawn and dusk; the fragrance hanging over the harbour led to its name. The city was originally ceded to the British “in perpetuity” with the Treaty of Nanking in 1842, which concluded the first Opium War. This was expanded to include Kowloon in 1860, mushrooming later to embrace the New Territories in 1898 on a 99-year lease. The year 1997 signalled the expiry of the New Territories lease, and the idea was that the whole colony should be handed back to China. The only demand was that Hong Kong’s way of life be guaranteed for the next 50 years. The Sino-British Joint Declaration was signed in 1984, and a basic law was drawn up for Hong Kong. Hong Kong, more fully called the Hong Kong Special Administrative Region, is an ambivalent city. While the outward guise of British culture—the wigged judges, historic buildings and afternoon tea—remain intact, the city has always been Chinese; the people, language, food, and culture are predominately Cantonese. Cantonese language differs from Mandarin which is spoken throughout the mainland. Mandarin is made of four tones, while Cantonese is made of nine tones. Covering a total area of 1,098 sq. km, Hong Kong consists of 257 islands dotted across the South China Sea. Hong Kong’s population is 6.8 million of which 98 percent are Chinese. New Territories is the largest area. 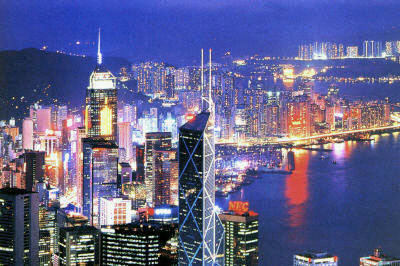 Hong Kong Island across Victoria harbour has a population of 1.3 million living in its 80 sq. km. Forty percent of the island is mountainous. Hidden away among high rise apartment towers and busy highways, the past lives on in the New Territories; a living museum shaped by the five great clans of Hong Kong [the Tang, Hau, Pang, Liu and Man]. I took the Heritage tour which takes in the historic sights around the New Territories, bringing to life the customs and cultures of these clans and providing a fascinating glimpse into Hong Kong’s rich heritage. Man Mo temples abound in the city, each built under the patronage of different families. The Man Mo Temple in Tai Po, one of the oldest temples in Hong Kong, celebrated its centenary in August 1992. Dedicated to the gods of Man [literature] and Mo [martial arts], this market-town temple is built as a central walled compound to emphasise seclusion. Its construction marked the founding of Tai Po New Market, a traditional Chinese bazaar selling a dazzling variety of fresh produce, seafood, dried foods, and daily household necessities. Man Mo Temple has also served as a community centre since its founding. Within the temple walls more than a century ago, defiant villagers chose to oppose Britain’s 99-year lease of the New Territories, sparking a five-day “war” that, however, failed to avert the area falling under British control. Worshippers in the temple precincts cast bamboo sticks amid clouds of incense to interpret their future. Chim are an assortment of numbered sticks placed in a bamboo container. After lighting incense and kneeling in front of the altar, the worshipper shakes the container in both hands until one of the sticks escapes and falls to the ground. The number is then interpreted for its message. The Chinese regularly make offerings to their ancestors. These take the form of various items which are burnt and carried through the fumes to the departed souls for their use. Originating in simple offerings of food and wine, the practice has taken an interesting turn in recent times—paper goods sold in funeral shops. These include cell phones, shaving kits, shirt and tie sets, and even CD players made of paper which can be offered through rituals to the spirits. Billion dollar notes are also available. After all a little extra cash always comes in handy, whether it is heaven or earth. Lung Yeuk Tau Village is home to the Tangs. The name Lung Yeuk Tau means “the head of a leaping dragon” and derives from a local legend claiming that a dragon once lived in the area. The Tang Chung Ling Ancestral Hall honours the Tang lineage, including a Song dynasty princess and her husband. Built in the early 16th Century, the exquisitely decorated three-hall building is still used for annual rituals and festival celebrations by members of the clan. The central chamber houses the soul tablets of the ancestors. The left chamber is dedicated to ancestors who had made significant contributions to the clan, or those who had achieved high ranks in the imperial court. The chamber on the right, on the other hand, is for the righteous ones. Lo Wai was the first walled village built by the Tang clan. Today it remains the cradle of clan activities and houses the family’s descendants. The narrowness of the entrance was meant to facilitate defence. Next to the entrance is a well, which used to be the water supply for the village. The houses inside are laid out in an orderly arrangement. 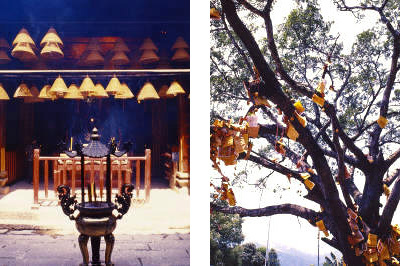 The Tangs of Lung Yeuk Tau still practice traditional village customs and festivals. Both the ancestral hall and walled village were declared protected monuments in 1997. Tai Fu Tai, my last stop, was an opulent stately residence built in 1865 by a senior Man clan member who achieved high grades in the Imperial Chinese Civil Service Examinations and was bestowed the title of Tai Fu [mandarin] by the Qing emperor. The extravagantly designed interior boasts three courtyards and is a striking example of how high-ranking officials once lived. I couldn’t be in Hong Kong and not take the Victoria harbour cruise. Come 7 pm, day 2, I left for Tsim Sha Tsui to take the star ferry across to Wan Chai on Hong Kong Island. Eight o’clock my two-hour Tsing Ma night cruise commenced. It was wonderful! The world famous Hong Kong skyline alit with neon lights flashing across the waters and skies; concrete and glass high-rises encrusted with millions of golden, red, blue, green, yellow, purple and silver lights. We floated past glittering cranes at the harbour and Tsing Ma bridge draped over midnight blue waters streaked with colour. Tsing Ma bridge is one of the world’s longest double deck suspension bridges carrying both motorway and railway. The translucent skies studded with diamond bright stars held vapory silver clouds in its midst. It was more than spectacular. It was man’s passionate, ambitious, vibrant, colossal decoration of god’s nature. My third day in the city was dedicated to Hong Kong Island. Hong Kong Island is where you find the stock exchange, financial district, legislature, government buildings, the most exclusive hotels and restaurants, and the most exclusive property. To the east and jutting out from Wan Chai is the splendid Hong Kong Convention and Exhibition Center extension. The Hong Kong and Shanghai Bank building, when completed in 1985, was the world’s most expensive building at almost a billion dollars. Not to be outdone, the Bank of China Tower thrusts up like a gleaming crystal with its sharp lines and ingenuity. It is designed to withstand typhoon stresses four times the equivalent of earthquake requirements in Los Angeles. Other landmarks are the Center and the International Finance Center. The world’s longest escalator [790 meters] ferries shoppers and commuters up to the mid-levels from Central, the financial district. The total journey time is 20 minutes. It was raining softly. Pelting down in little drops from a grey overcast sky. After shuttling between a series of minibuses, whilst they tried to organize us tourists into little groups, we finally set out for our first stop, a Man Mo Temple notable for its many fine, well-polished brass and pewter incense burners. This was followed with a ride on the Peak Tram to Victoria Peak. The Peak Tram, a double reversible funicular railway, has been an integral part of Hong Kong life and one of its best loved attractions for more than 110 years. Since it carried its first passengers on 30 May, 1888, millions of residents and visitors have been enthralled by the spectacular panorama unfolding as the train climbs up smoothly to 368 meters above sea level at dizzying angles ranging from 4 to 45 degrees. Victoria Peak is the most expensive piece of real estate in the world. At 552 meters, it is home to Hong Kong’s elite, and the closer to the summit you get, the more stunning the price. It was colonised by the British establishment eager to escape the suffocating summer heat below. The Aberdeen Fishing Village gave us a unique opportunity to see the lifestyle of Hong Kong’s fishing folk. I took a sampan ride which took me on a chug past houseboats with clothes drying on the lines, women cooking on deck whilst children played and paused to stare, and old men rested on deck chairs reading the daily newspaper. A two-second glimpse between the thick foliage hugging the hills told me we were passing Repulse Bay, the most popular beach in town. Stanley market, packed with souvenirs, t-shirts and bargain price designer labels, interspersed with pastry and coffee shops, was rightfully the last stop. I bought my laughing Buddha and wandered through alleys where there were more foreigners than locals. Hong Kong buzzes with active humanity. Thousands of men and women, both sexes small, thin, decorated with jewellery, fashioned long hair, and designer labels rush in endless streams through the city, carrying huge shopping bags and pretty umbrellas. Glued incessantly to their cell phones and i pods, human bodies and technology form a continuous whole. I wished the scene would freeze. Pause. Just for one second. But it kept racing by, as if on fast forward, with a life all of its own. It was not the life of the individuals. It was instead the vibrant, vigorous, restless soul of Hong Kong, beating so fast you could hear it, and bursting forth through the millions of humans who rose and swayed as if but waves in the ocean. I left my luggage with the concierge and walked to the pier across the Marco Polo shopping centre where my hotel was located. My flight was at 12 midnight. Climbing up a thick rounded pole, I sat cross-legged watching Hong Kong Island spread out in front of me across the satin waters. The mist slowly lifted. Birds flew overhead and golden lights started to flicker in the scene. A warm lazy wind held me close. I felt incredibly free. Unattached to past and future. To thoughts, emotions, memories, things. It was just me. Complete in my own self. My journey was over. It had been a long and memorable one. A whole month in a foreign land, listening to the traveller’s call within me. I had travelled thousands of miles through soaring mountains and wide rivers. Visited cosmopolitan cities and rustic villages. Entered holy abodes and mortal dwellings. Smiled into the eyes of countless souls. I was reaffirmed in my faith on life. That a traveller’s soul was God’s child and this whole world was its home. This entry was posted in China, Exploring our World and tagged Hong Kong Island, New Territories, Things to do in China, Things to see in Hong Kong, Victoria Harbour Cruise by Rama Arya. Bookmark the permalink.